ATL Corporate Limo is a most dependable limousine service around the Metro Atlanta we are very proud to be a step above the rest we remain dedicated to providing on time service to our Celebrity and Corporate clients in our luxury sedans, stretch limousines, vans and SUVs’. ATL Corporate Limo offers a full range of services from special events, corporate travel and airport transportation our mission is to provide the highest level of customer service, treat yourself to an extraordinary experience you won’t forget. Black Lincoln Towncar. Stock with daily news paper, and bottled water. Cell phone usage available upon request. Black Stretch Limousine. Fully loaded with Bar, neon lights, TV's with Satelite, DVD Player, and ipod connection, bar is fully stock with bottled water, and Snacks. Additional Beverages available upon request. Black Chevy Suburban. Seats 6-7 Passengers with leather seating. Stock with Daily news paper and bottled water. Cell phone usage available upon request. Brand New Black 20 passenger SUV Limo. Complete with stock Bar, Neon lighting, DVD, Satilite, and I-Pod connection. Other refreshments availiable upon request. Peferct SUV Limo for Prom, Weddings, or any special event. Brand new Shuttle bus. Seats 25. Great for touring the city, or shuttling peopel to and from Locations. Has a Bar, reading light, reclining chairs, TV's with Satilite and DVD connections, I-POD connection, and much more. Offers comfort and luxury, equipped with a DVD, CD, AM/FM stereo , PA System, individually controlled lighting, heating, and cooling environment, and a convenient clean restroom. The smooth, comfortable ride is enhanced by the excellent front and side views.... 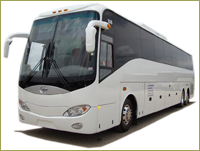 This 55 Passenger luxurious executive style motor coach offers a smooth comfortable ride for your group. .